I haven’t a lot to go on with this, it’s parked in the yard of the Highland Garage at Inverness next to a Tiger that looks as if it has recently been towed. The registration suggests this early Bristol RELH6G was new to United Welsh Services; Buslistsontheweb.co.uk confirms January 1964 registration by that operator as its number 18. 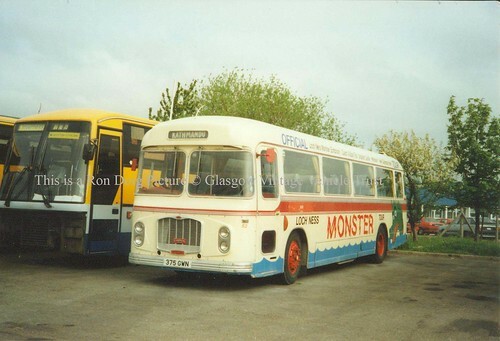 The gold leaf fleet number (52) and the base livery of cream with a red band suggest it was sold out of preservation, as does the Gardner badge on the grille. The legend replacing the THC fleetname is not readable at the resolution of the scan; it just might read ‘LIZ’. Just why it was chosen at its advanced age to undertake ‘The Official Loch Ness Monster Tour’ is beyond my ken, as is why the blind box shows Khatmandu as its destination.